RestorFX pioneered the most advanced paint restoration and paint correction technology on the market that will restore a vehicle’s finish to look like its original factory condition. This all-new Polymimetic Coating Technology mimics and blends with the original finish, chemically adhering to it and filling-in damage for complete restoration. ClearFX Protect is the finishing touch and extra layer of protection that a vehicle needs once it has been fixed and filled with ClearFX Restoration and ClearFX Paint, respectively. Simply think of Protect as the screen protector on a new cell phone or as a super-wax over a nice paint job. It provides a vehicle’s brilliant new finish with a stalwart shield against further damage. RestorFX is changing the industry by returning a vehicle’s paint back to a factory-quality. Paint restoration effectively removes scratches, abrasions, swirl markings, discoloration, oxidation, minor road damage and other imperfections. Most automotive detailing methods attempt to remove the layer of clear coat so that existing scratches and imperfections disappear. This method literally removes a layer of the existing clear coat, which gives the paint a dull look and often eliminates the protective clear coat layer. Instead, Restor FX restoration literally chemically repairs the damaged clear coat, by levelling it and filling the damaged areas. Thus, instead of reducing the clear coat to the common baselines, Restor FX Restoration increases the entire quality of the vehicle. 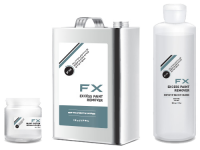 Paint RFX System is tailored to work directly with RestorFX Restoration. This System ensures that deep chips and dings in the vehicle are fixed and repaired so that the beauty of the new gloss on the vehicle is not marred by remaining damage in the paint body. While some attempt to fill these chips and dings by using a small paint brush, we feel that this system has many flaws – the main one being that liquid, when simply placed on a surface, tends to form a spherical shape and these chips, when filled with a small brush, are typically left with “globs” instead of chips. Rather than filling in chips with globs of paint, the RestorFX Paint System places paint inside the chip with a process that results in a flush even finish. No globs, just a nice even fill. Removes 99% of all clear coat damage to an automotive paint finish. Protects against further damage from adverse weather and normal wear and tear. Repairs chips and scratches that have penetrated through paint. Achieves a smooth and consistent appearance without the globs created by many other touch-up paints. Provides an additional layer of protection against weather and wear and tear damage. Maintains a beautiful and long-lasting factory-quality shine and color. Swirl marks and others minor blemishes have been repaired and are not cosmetically covered but nonexistent. A new finish and shine has been added which cannot be washed off.